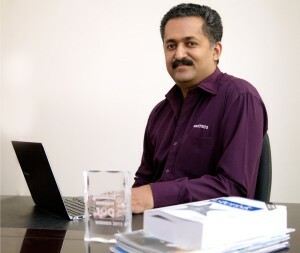 Asterisk is a software switching platform, capable of running on standardised PC hardware with accessories to connect to various telecom networks. In this second article in the series, the author describes various kinds of hardware and accessories that are needed to connect to different kinds of networks. To understand and use the full power of Asterisk, we need to have a good understanding of the possible hardware accessories involved. The objective of this article is to introduce you to different kinds of hardware in the Asterisk world. Nowadays, any standard desktop or server comes with IP connectivity. So, if we are connecting IP phones to each other through the PBX, we need not use any additional hardware. However, we also need to connect to landlines, mobile phones, etc. For this, there is hardware to connect to a PSTN network or a GSM network. Let us examine these devices, individually. VoIP phones are directly connected to the server over a LAN. The dominating protocol standard is SIP (Session Initiation Protocol). Some phones support IAX, a proprietary Asterisk protocol, which uses less bandwidth and has better jitter buffer control to improve the audio quality. When starting, the phones boot themselves and register with the configured server and from then on, they can receive or make calls. The phones are also capable of registering with multiple servers, so that in redundancy scenarios, they can switch over to the redundancy server with ease. Free software like X-lite/Eyebeam or open source software like Blink can be downloaded and installed on a desktop. The GUI resembles a dial pad, and with the help of a headset with a microphone, the desktop can be turned into a phone. You may also use the microphone and speaker of the desktop or laptop. After starting the software, it registers itself with the Asterisk PBX and starts receiving as well as making calls. 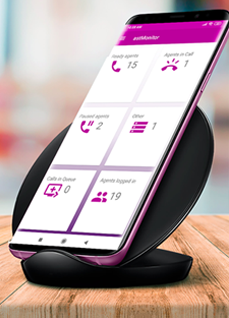 VoIP clients, available on smartphones, can connect to the PBX server over Wi-Fi and function like any other phone. One open source VoIP smartphone is the CSipClient, which can be downloaded freely from the Google Android Play Store. This client opens up innumerable application possibilities, as follows. Phoneless desktop: Users need not clutter their desks with standard phones. Their mobile phones can serve as an extension to the PBX. Outside the office, these can be normal GSM phones; inside the office, they turn into dual phones, which can also act as extensions. Roaming extension: Doctors roaming around hospitals, work-site supervisors, hotel staff, hotel room guests, etc, are rarely found at their desktops or in their rooms. With Wi-Fi technology, they are always logged into the IP PBX and are, therefore, reachable. Cost savings: The user is always logged into the PBX and therefore can route all the calls through the PBX, which could be cheaper, especially when the volume of calls is high. FXO or FXS are used to denote various connections in analogue technology (or POTS Plain Old Telephone System), which is the most common SOHO (Small Office Home Office) technology prevalent in India today. FX stands for Foreign eXchange. FXO (Foreign eXchange Office) is the line which connects to the local telecom switch and FXS (Foreign eXchange Subscriber) connects to the phones or other end user devices like fax machines. Analogue telephones are the cheapest user equipment available, with prices starting as low as ` 300 compared to a VoIP telephone starting at ` 3000. An FXS gateway/card connects an analogue phone to the Asterisk server. Most of the interface hardware comes in two forms, i.e., PCI/PCIe cards, which can be inserted into the server or external standalone gateways connected to the server over IP. These devices can have multiple portsthe common ones are FXS cards with up to 16 ports or gateways with up to 48 ports. For a larger number of ports, it is advisable to use multiple gateways. Analogue trunks are the most common trunk connection available for PBX equipment to connect to the outside world. 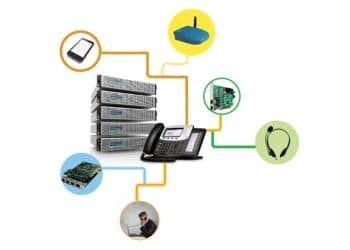 With the help of a VoIP FXO gateway or card, one can connect the Asterisk equipment to the PSTN world. Their dimensions or capabilities are given as 1-, 2-, 4-, 16-port, etc. ISDN (Integrated Services Digital Network), which is purely a digital network, is the next generation of telecommunication networks, a step up from analogue networks. PRI (Primary Rate Interface) and BRI (Basic Rate Interface) are the two common connection types available. PRI is a 4-wire interface to the customer, and can carry 30 B channels (voice channels) and one D channel (control channel) in an E1 configuration, the most common in the Indian scenario. There is also a T1 configuration with 24 B channels and one D channel, which is more prevalent in the US. The BRI with two B-channels and one D-channel is meant for SOHO use. In India, generally only PRIs are used in the corporate scenario, and BRI is non-existent, for all practical purposes. The PRI card can be inserted into the server PCI or PCIe slot, and can be configured as NT (Network Terminator or trunk side equipment) or TE (Terminal Equipment or subscriber side equipment). A PRI connection can have one pilot number and multiple subscriber numbers or DIDs (Direct Inward Dialling), typically 100. The mobile network, specially the GSM mobile network, is the most popular and widespread network nowadays. The GSM gateway or card makes it possible to connect Asterisk directly to this network. This equipment resembles a mobile phone, where a SIM card can be inserted, and comes in 1, 2 or 4 ports. The GSM network can also be used as a backup for the POTS or ISDN lines. For large density connectivity, VoIP GSM gateways are suitable, which come in 8, 16 and 32 ports. An echo is the phenomenon by which sound is repeated, which in turn affects the clarity of the sound. Asterisk has built-in software routines to combat this problem. In cases where the software routines are not effective, DSP-based hardware is available for analogue as well as PRI hardware. Most of them are ‘piggy back’ modules, which have to be plugged on to the existing boards. Conversations can be logged within Asterisk without any additional device. A command in dialplan is enough to activate the voice logging feature in Asterisk for calls passing through the Asterisk equipment. Asterisk can also operate as a voice logger system for other systems in an active or passive mode. In both cases, the line to be tapped has to loop through the voice logger system. In the case of active voice loggers, interface cards with double ports of the interfaces to be tapped are required, i.e., to tap one PRI, we need a 2-port PRI card. The line to be tapped is connected to the voice logger system and the destination system also. When a call comes, the connection is established to the voice logger system, and then again a back-to-back connection is generated to the destination system. The calls are recorded in a similar manner in an Asterisk system using dialplan. In case of passive voice loggers, a passive interface card with double the number of interfaces to be tapped is connected. The main difference is that there is no connection established to the voice logger system. The voice logger system passively taps the required information and stores it. Redundancy hardware can be created easily by having a mirror copy of the existing server. In case of a crisis, when the primary server crashes, the situation is detected by noticing missing live messages between the systems; and then redundancy hardware can take over the operations. The IP phones and other IP-based equipment can be easily switched over to the new server. A complicated case would involve switching over the physical layers of interfaces like FXO and FXS, which are directly connected to the server, for which physical switchover hardware is available. Manufacturers provide physical hardware where, for example, the FXO line is connected. The output is duplicated and connected to the primary and secondary servers. The control signals to the device can come from the primary and secondary servers through the USB port or the IP port. As soon as a critical situation is discovered, the relays are activated and the physical connection is changed to the secondary server. Paging systems could be overhead announcement speakers, which switch on, when dialled, or a group of phones which automatically switch on the speaker when dialled from a particular extension. Newer paging systems also allow two-way communication, by allowing the receiver also to pass back messages. SIP-based paging systems are available, which will accept the call as soon as the call comes, amplify the voice and output it through speakers. Asterisk supports creating multiple groups of paging devices and also incorporates the two-way messaging option. A visitor might ring the house bell, and one can pick up an internal phone to communicate with him or her. There are a few SIP door phones available. Else, it is possible to connect an analogue phone with an FXO card to Asterisk. We have now explored quite a lot of Asterisk hardware, which enhances its capabilities in the IP world by interfacing with other telecom networks, and carrying out multiple tasks. The power of applications on a simple switching platform is sometimes magical.